Genuine Dyson spare part for wall mounting your Dyson DC30, DC31 or DC34 handheld vacuum cleaner ..
Genuine Dyson combination crevice and dusting brush tool for Dyson DC50 vacuum cleaners. .. This universal Vacuum Cleaner Soft Dusting Brush Tool could be exactley what you need for those hard.. This is a genuine Dyson replacement stair tool for your vacuum cleaner. 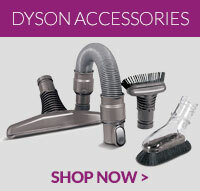 With velour strips to ..
Genuine Dyson carbon fibre floor tool for Dyson DC26, DC38 & DC47 vacuum cleaner models. ..
Genuine Dyson crevice tool for Dyson DC23, DC23 T2 and DC32 vacuum cleaner models. ..